The much-loved Galvin HOP in Spitalfields has undergone a face-lift this summer to reveal a brighter, funkier and more relaxed environment where customers can dine on the new Modern British inspired menu. Menus have been refreshed to reflect the relaxed surroundings, with a daytime a la carte menu consisting of delicious pickings. 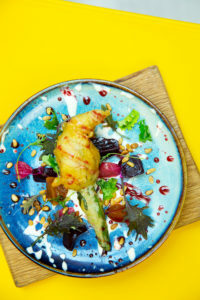 Starters include tempura courgette flower with goat’s cheese, beetroots and pine nuts, or breaded scallops, chorizo, celery and tarragon mayonnaise. For main course choices include seasonal specialities including lamb steak on the bone with peas, goat’s curd and Jersey royals or baked halibut with Kalamata olive, fregola and saffron aioli. Executive Head Chef Zac Whittle, who took inspiration for the new modern menu at HOP from trendy pop-up supper clubs that he was involved in, says that giving guests fresh and interesting flavours in a relaxed environment is key. Menus change daily according to what is fresh, with the Galvin’s placing a large emphasis on sourcing locally to support the community. Fruits and vegetables are picked at New Covent Garden Market, and fish is caught by one of London’s most sustainable fishmongers and delivered fresh to HOP. The Galvin’s have made a significant effort towards sustainability too, having removed plastic straws from all of their restaurants. Thirst-quenching drinks are abundant at the new HOP with speciality Pilsner Urquell tapped by qualified ‘tapsters’, ensuring that customers receive the perfect pour. A variety of canned craft beers are now available from London breweries such as Truman’s and Beavertown. For wine lovers, wine is served by the bottle, glass, or on tap from HOP’s intelligent wine tanks. Early evening entertainment is on the cards for the modern bistrot with a line up of DJ’s providing great tunes for al fresco diners.